In life and in flooring, paying attention to the little details makes a big difference. The right joints, patching & striping for your concrete flooring have a major impact on your facility maintenance, preserving your floor slab structural integrity and your overall safety. We provide epoxy floor maintenance and more, so your ongoing needs can always be met and your flooring system kept well-preserved. Whether it’s a control or static joint, or whether you’re undergoing new construction or restoring an existing concrete floor slab, you can count on our elastomeric and rigid joint treatments to perform. Give your concrete flooring the critical additional support of a backer rod, or our aggregate filled resinous mortars. Fill completely, or top off with one of our more flexible joint-filling products to allow for movement between concrete flooring slabs. Repairing concrete cracks and filling in small pot holes as soon as you notice them can save on costly renovations and worker safety issues later, and with our convenient kits, it’s quick and economical. Of course, having the right concrete flooring patching product for the job is critical. While an aggregate filled epoxy floor maintenance mortar is right for one situation, patching with aggregate filled, moisture-tolerant cementitious urethane may be better on another floor, while an MMA mortar might be ideal for a cold floor environment. 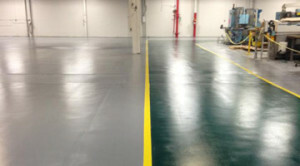 In other cases, our thixotropic gelled epoxy concrete flooring patching kit is the best option—it all depends on your facility’s unique needs. Bright, clearly visible concrete flooring striping helps direct everyday facility traffic, keeping people safely in pedestrian lanes and machinery like forklifts along a distinct path. 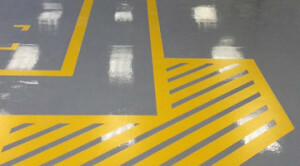 In case of emergency, well-marked flooring can serve as a guide for employees and first responders. Our high performance, durable resin kits ensure that you won’t have to refresh your floor markings as often, even in high-traffic environments. Ask about large scale custom floor decals, which can be incorporated into your high performance coating system to demonstrate company, school or team spirit. It’s a fun, organic way of instilling pride of place among your building’s regulars, while offering a unique welcome to outside visitors. With Florock’s wide selection of joints, patching & striping solutions, you’ll see that our quality is consistent right down to the tiniest details.